Coming home to find your fiancée's diamond engagement ring abandoned on the table doesn't seem like a situation with many upsides. But for Josh Opperman, the end of a romantic relationship left him engaged with something far shinier. In an effort to move on, the former market researcher decided to sell the ring, expecting to recoup a fair portion of the $10,000 he'd spent. Instead, retailers offered him, at most, 35 percent of its value. In 2007 a frustrated Opperman founded I Do Now I Don't, an online marketplace for "pre-loved" engagement rings. "We have a higher average sale than most e-commerce sites that sell engagement rings, and I think that's because of the safety and the reputation that we have," Opperman says. Indeed, he notes, consumer confidence is the company's central selling point. When a sale is made via the online marketplace, the money is put in escrow, and the item is sent to I Do Now I Don't in New York City, where it is verified by a gemologist. "This way, it's impossible for someone to get scammed," Opperman says. I Do Now I Don't averages 325 listings per month and 150 transactions, generating monthly sales of about $200,000. 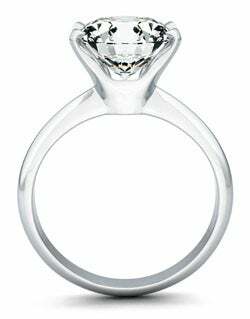 The site has expanded beyond engagement rings to all types of jewelry, and even wedding dresses. Not all that long ago, proposing with a secondhand diamond--especially one bought online--would have been unthinkable to many. Now, however, "the stigma of buying something pre-owned or old is gone," according to Farnoosh Torabi, a personal finance expert in New York City. "If there's anything the recession in particular has taught consumers and has ingrained in their mindsets [it's that] you don't pay retail. Period." Sellers on I Do Now I Don't are encouraged to share the stories behind their decision to part with an item, from humdrum to mawkish to downright depressing. "I've seen them all, from people getting cheated on to running out on their wedding day," Opperman says. "One woman was selling her ring to get breast implants." Andrea Hester, a marketing manager for an Illinois-based design company, sold her engagement ring on I Do Now I Don't to put the past behind her after a divorce. She's now remarried and saw the sale as a way to give someone else a (discounted) chance at happiness. "There was something symbolic in selling the ring," says Hester, who earned back about 50 percent of its original value. Excited to grow his five-person company, Opperman, too, has had a second chance at wedded bliss: He says he's now married to "the real love" of his life.